NEW YORK -- MTV and Universal Music Latin Entertainment, the label behind summer hit "Despacito," are at odds over why the video did not earn a nomination for the MTV VMAs. MTV says Universal did not submit the video for consideration, but the label says MTV didn't ask for them to submit the video until last week -- two weeks after the network announced its VMA nominees. "Despacito" has not aired on MTV or MTV2, but it is being played on MTV Tres, the company's Latin channel. As for the VMAs, MTV said "the 'Despacito' video was not submitted for consideration" in a statement to The Associated Press on Monday. The omission is surprising considering "Despacito" is the most streamed video ever on YouTube. "Until last week, MTV hadn't solicited UMLE to submit the video for consideration," a spokesperson for the record label said in a statement to the AP after it published a story on the reason for "Despacito's" exclusion from the awards show. It is unclear why the network solicited the label for a submission after the nominations had already been announced. MTV did not immediately respond to a message seeking comment Monday afternoon. MTV announced its VMA nominees on July 25. The network said Monday that "Despacito" - the song not the video - will be acknowledged at the VMAs as a nominee in its song of summer category. That category and its nominees will be officially announced the week of Aug. 21. The label said it hopes MTV will air the video at some point. "UMLE is surprised and happy to learn that MTV plans to recognize 'Despacito' in the VMA's 'Song of Summer' category," the label said. "We hope the nomination will lead to MTV airing the full video on their main channels." MTV did not explain why it has not played "Despacito" on its main channel when asked by the AP. 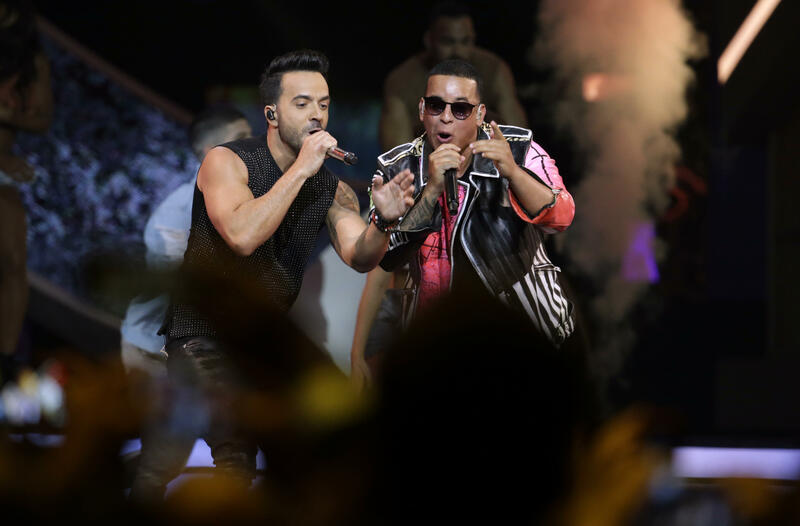 Luis Fonsi and Daddy Yankee's hit song recently became YouTube's most viewed clip of all-time, surpassing 3 billion views. "We're proud to work with MTV to expose new audiences to our artists' music and we would welcome MTV's decision to recognize Spanish-language videos on its main channel and the Music Video Awards program," the label said. The VMAs will air live on Aug. 27. MTV, which mainly airs reality shows like "Teen Mom" and "Catfish" throughout the day, rarely plays music videos on its main channel. MTV2, MTV Classic and other spin-offs air videos regularly. "Despacito" is the rare Spanish track that has become a massive success in the U.S. and around the world. The hit song, which recently became the first video to hit 3 billion views on YouTube, has become the most streamed track of all-time and is spending its 14th week at No.1 on the Billboard Hot 100 chart. It is the first mostly Spanish song to top the Hot 100 since Los del Rio's "Macarena" in 1996 and has sold more than 7.7 million tracks based on digital sales, audio streaming and video streaming. "Despacito" missed out on VMA nominations such as video of the year, best collaboration, best editing and other more. In an interview with the AP, Fonsi said he didn't notice the video wasn't nominated for the VMAs and he's happy with the song's massive success. "Awards are very important but what bigger award (is there) than having the most watched video in the world in history? It doesn't really get any bigger than that," Fonsi said, referring to the song's YouTube record. "Hopefully it'll win some awards down the line, down the road, but I think I got the biggest one so far, straight from the people." Nominees for the top VMA prize, video of the year, include Kendrick Lamar's "Humble," Bruno Mars' "24K Magic," the Weeknd's "Reminder," Alessia Cara's "Scars to Your Beautiful," and DJ Khaled and Rihanna's "Wild Thoughts," which was released in June, a month before MTV announced its nominees. The 2017 VMAs will air live from the Forum in Inglewood, California. Lamar is the top nominee with eight, while the Weeknd and Katy Perry -- who is hosting the show -- each earned five nominations.